On 13 September, 1840, Daniel Gooch, locomotive superintendent of the Great Western Railway, wrote to Isambard Kingdom Brunel, the railway's chief engineer. The letter he wrote (see link below) proved the single most important piece of paper in Swindon's history. In it, Gooch put forward his proposal for the building of the Great Western's much-needed engine works. The railway, which passed below the small hilltop town of Swindon, already promised to have an impact on the area as this was the spot for an important junction - the London to Bristol line also forking to Cheltenham. 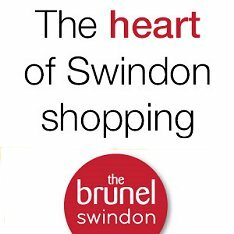 But now Gooch was recommending to Brunel that Swindon should also be the site for the new works. The two men met at Swindon to consider their options and, according to legend, one of the two hurled either a sandwich or a rock to determine exactly where the foundation stones should be laid. So Swindon it was to be. 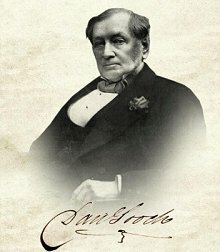 Gooch was proud to be called 'the father of Swindon works' and by the same token he was also the father of New Swindon. He chose Swindon even though there were neither readily available skilled workers nor homes to house them. He knew that he would effectively be founding a whole new town. Gooch had always relished the opportunity to make such decisions. A hard-working man who expected the same of the men he appointed, he was not even 21-years-old before he convinced the great Brunel to put him in charge of all locomotive operations on the Great Western line. "I was very young to be entrusted with the management of the locomotive department of so large a railway," Gooch said, "but I felt no fear." Remarkably, and unlike all of his successors, Gooch never actually lived at Swindon. He appointed works managers to see to the day-to-day operation, but retained overall control. And he was sufficiently aware of the company's obligations to its workforce to take a personal interest in the social life of the town. It was a town, after all, that he had put on the map and, when complaints of drunkeness, boredom and social depravation reached him at his home in London, he acted quickly. The result was the formation of the Mechanics' Institute, a ground-breaking organisation that transformed Swindon men into the best educated manual workers, possibly in the world. Although it has to be said that the idea nor the main driving force was Gooch's, without his support the Mechanics' would never have existed. And it was Gooch who appealed to the directors of the GWR when depression hit the works in the mid-1840s. He not only appointed a doctor but secured him free lodgings, leading to the formation of the Medical Fund, which later became the model for the National Health Service. He later wrote: "While I strove to do my duty I remembered that the moral welfare of those under me was a thing for which I would have to answer at a higher tribunal. The happiness of my men and their families depended much upon the influence I exerted over them, and I have striven to make the influence beneficial." In return, Gooch expected the same dedication as he put into his own work. In one famous incident, a driver who leapt from his train just before it crashed and was concussed, was dismissed when he regained consciousness for not remaining with the engine. On the engineering side, Gooch showed that he had learned much from his experiences as a young man. 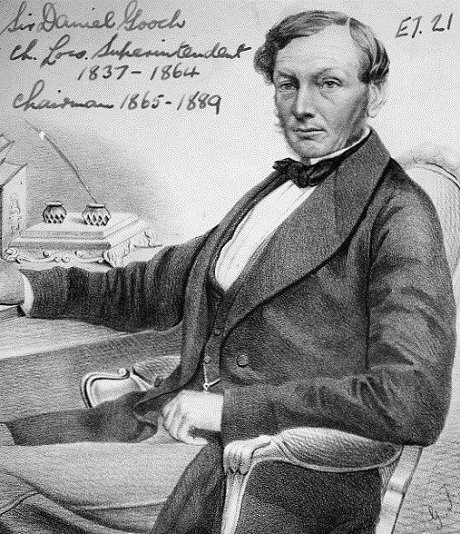 Born on 24 August 1816 in Bedlington, Northumberland, his first taste of industry had been in ironworks, but his association with railways began when he worked under the great Robert Stephenson, who was a friend of the family. Gooch had already prepared designs for a Russian railway before meeting Brunel. He shared with Brunel a passion for broad gauge locomotives which, travelling on tracks seven feet apart, were considered to be "safer, swifter, cheaper to run, more comfortable for passengers and more commodious for goods". Unfortunately, the trend was towards narrow gauge and Brunel and Gooch eventually had to come to terms with bitter defeat in "The War of the Gauges". Gooch's name is often tarnished by his association with the broad gauge, though hindsight seems to support Brunel and Gooch's convictions. Today's much larger, faster trains would have benefitted by the increased flexibility of a broad gauge network without narrow bridges and their low headroom. Broad gauge or not, there is no disputing that Gooch's designs were at the leading edge of locomotive design. 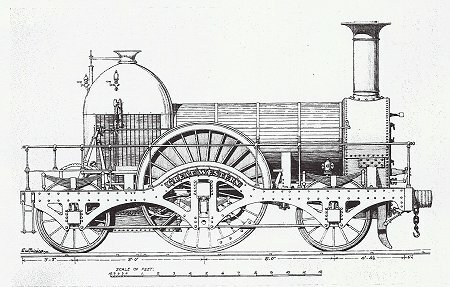 The GWR's first locomotives - North Star and the Fire Fly class - were supplied by contractors, but as soon as Swindon Works was able to provide the framework for the manufacture of engines, Gooch took the initiative. The first to be wholly produced there was called Great Western (pictured above) and set new standards of power and speed. Its seven hour round trip to Exeter was at an average of nearly 57mph, a remarkable achievement for the 1840s. And Gooch was not afraid to modify and experiment. Though the Great Western began life with six wheels, he added an extra axle to give more support to the massive engine and she remained in service for 24 years - long after Gooch himself had passed on his responsibilities for the GWR's locomotives. The successor to the Great Western, the Iron Duke class, proved just as durable, with the most famous engine of this class, The Lord of the Isles, clocking up nearly 800,000 miles in 30 years with its original boiler. It was one of the stars of the Great Exhibition of 1851 and was as much a favourite with the Swindon workers who had built her. By the time Gooch resigned from his post in 1864, tired of opposition from the GWR board, Swindon had a formidable reputation for the quality of its output. In Joseph Armstrong, who Gooch had recommended (with his own brother as an alternative), the GWR also had a worthy successor. Gooch's mind turned to other things and in 1865-66, using Brunel's steamship, the Great Eastern, he masterminded the laying of the first transatlantic cable. Ironically, after 27 years of railway innovation, it was this that he would be best remembered for. It also earned him a baronetcy. But Gooch's influence on Swindon had by no means ended. In 1865 he became MP for the Cricklade constituency which included Swindon and was to represent the area for 20 years. When he was also elected chairman of the GWR later the same year, he was able to support the Swindon cause to its fullest. And things came full circle. Now a decision to build a new carriage and wagon works needed to be made and although the nod was first given to Oxford, Gooch halted the project. Surely mindful of his decision a quarter of a century earlier to site a new factory at Swindon, he again chose the town for this latest expansion of the railway. It was no wonder that news of his death, in 1889, was greeted with much regret on the streets of Swindon. Alan S Peck, author of the definitive history of the works, concluded: "His final assessment must be as one of the giants of the Victorian age, both as engineer and businessman, with the religious and moral outlook of the times which demanded justice at all times in his dealings with others whatever their position in life. Swindon itself can never repay its debt to him." • A total of 407 broad gauge and 98 narrow gauge locomotives were built to Daniel Gooch's designs - a grand total of 505. Around half of the total in each gauge were built at Swindon. • Gooch built locomotives for the Bristol and Exeter Railway, the Vale of Neath Railway and the South Devon and Cornwall Railway as well as the Great Western. • Gooch represented the Cricklade parliamentary constituency as a Conservative from 1865 until 1885, but never made a speech in the House of Commons. • He was so well known in Victorian society that The Times issed daily bulletins on his health in the days leading up to his death at his home at Clewer Park, Windsor, in 1889. 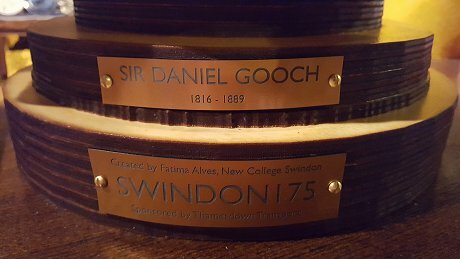 • Commenting on the rise of Swindon in the 1870s, Richard Jefferies wrote: "Much, if not all, of this marvellous transformation, of this abounding life and vigorous vitality, is due to the energy and forethought, the will of one man... Daniel Gooch." • On his death, Gooch's estate was valued at around £750,000 - almost ten times the amount left by Brunel and equivalent to about £50million in today's terms. 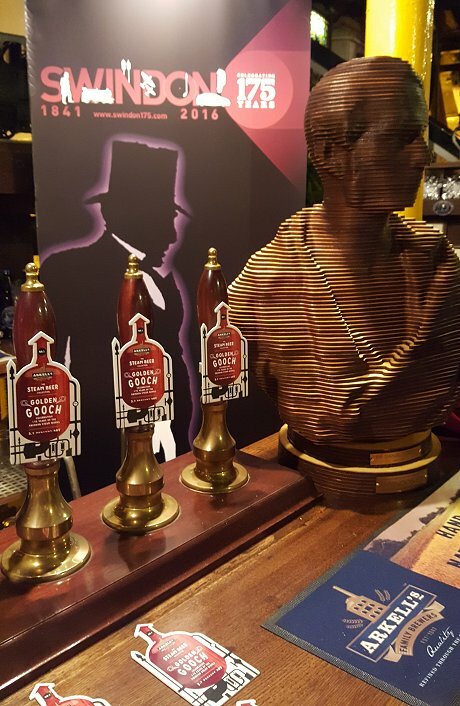 • Gooch is remembered in Swindon today in Gooch Street, a terraced street close to the railway, and was also commemorated by the Sir Daniel Arms pub in Fleet Street, a stone's throw from the Railway Village. They are perhaps appropriately modest monuments for a modest man. • The North Star and the Lord of the Isles were destroyed in 1905 because they were occupying 'valuable space' at Swindon Works. A replica of North Star has since been built and can be seen at Swindon Railway Museum. A working replica of a Firefly which will run on broad gauge tracks, is currently being built by the Great Western Society at Didcot. 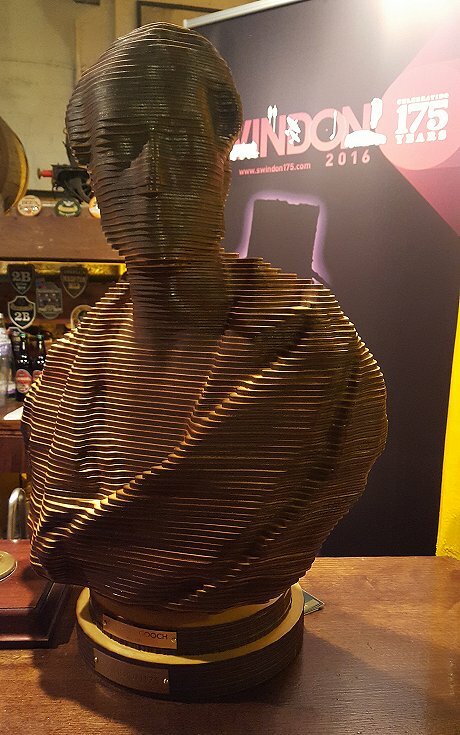 A superb 3D printed bust of Sir Daniel Gooch, the Father of the #Swindon Works, made by students at New College, Swindon was unveiled at Arkell's Brewery on the 200th anniversary of Gooch's birth. 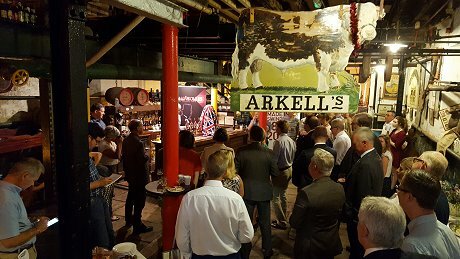 The event was part of the Swindon175 celebrations and included the first look at a limited edition beer brewed by Arkell's (available in pubs from 30 August) to mark the occasion.